So, maybe we weren’t as creative in naming this pastry, but can you blame us? It is hard to think of a better word to describe what this pastry does once it goes in the oven (see picture below.) 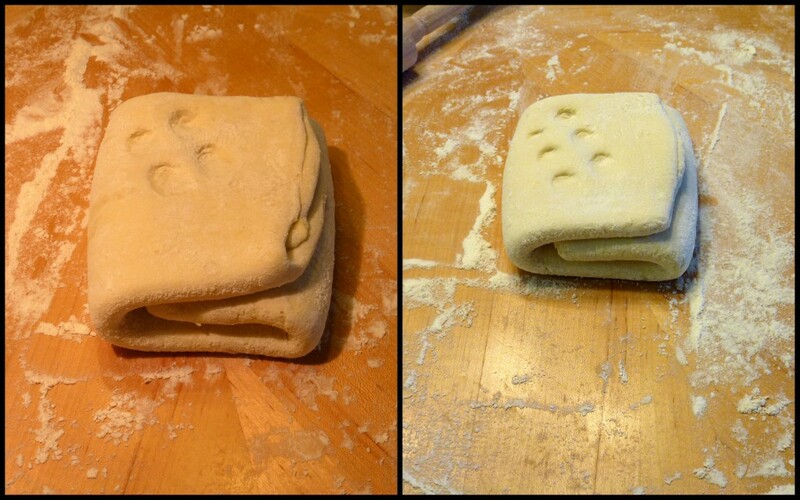 On the left is raw dough and on the right is the puffed up pastry after baking. Puff pastry is definitely ones of the best inventions ever. Flaky, buttery, and incredibly versatile, it is a great thing to have in your freezer at all times. Whether you buy it frozen, or make your own, it can be used to make an almost infinite number of possibilities. These include both sweet and savoury treats (vol-au-vents, palmiers, and turnovers, to name a few.) There are also some other variants of puff pastry, one of which is my all-time favourite: croissant pastry. 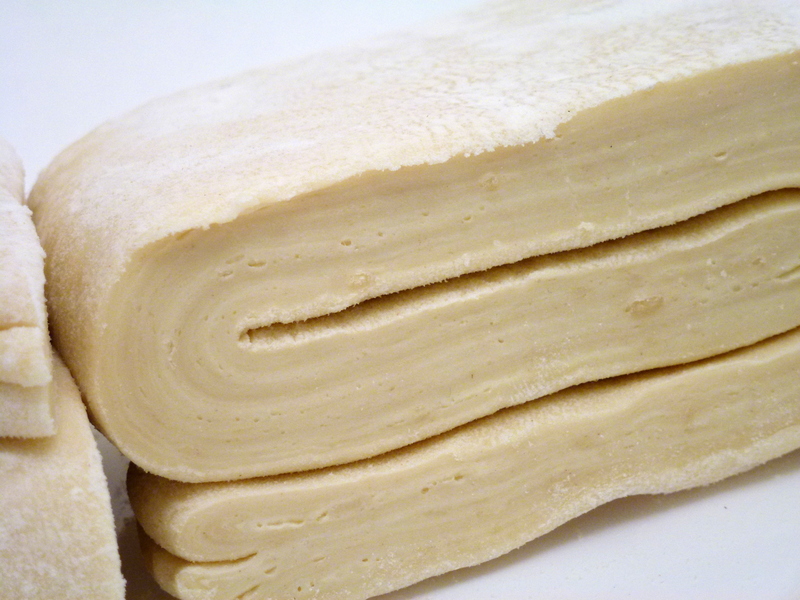 Like I’ve said before, I prefer making my own puff pastry, even if it is a lot of work. Anyone can buy frozen pastry, roll it out, and bake it, but only the truly motivated (or those with lots of time of their hands) can spend an entire day just making the pastry alone. Despite puff pastry being quite finicky to make, it is actually pretty forgiving if you mess up. I’ve made excellent-tasting puff pastry that rose beautifully even though I was convinced it was a failed, butter-leaking disaster during its production. Fold butter inside the dough. Bake, eat, and enjoy num num num. 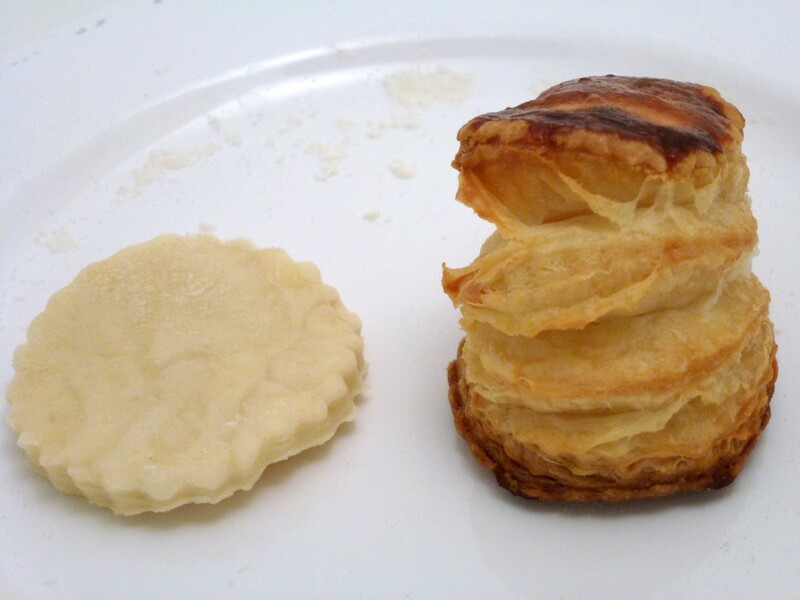 Now let’s do a little math to figure out just how many layers there actually are in puff pastry. When you first fold in the butter between two dough layers, you have 1 layer of butter. After you roll out the dough and make your first fold (into three) you are left with 3 layers of butter. Fold it again and you are left with 3×3=9 layers of butter. You typically want to repeat this rolling/folding pattern to do a total of 6 turns. That means you will end up with 3x3x3x3x3x3 (or 3^6) = 729 layers of butter. Equally important as all the layering steps are the refrigeration steps. Resting the dough helps relax the gluten, thereby making the dough easier to roll out. Furthermore, refrigeration maintains the pastry and butter at a certain temperature, which is essential for the process. If the butter is too warm, it can ooze out between the layers, resulting in a mess and a pastry that won’t rise as well. 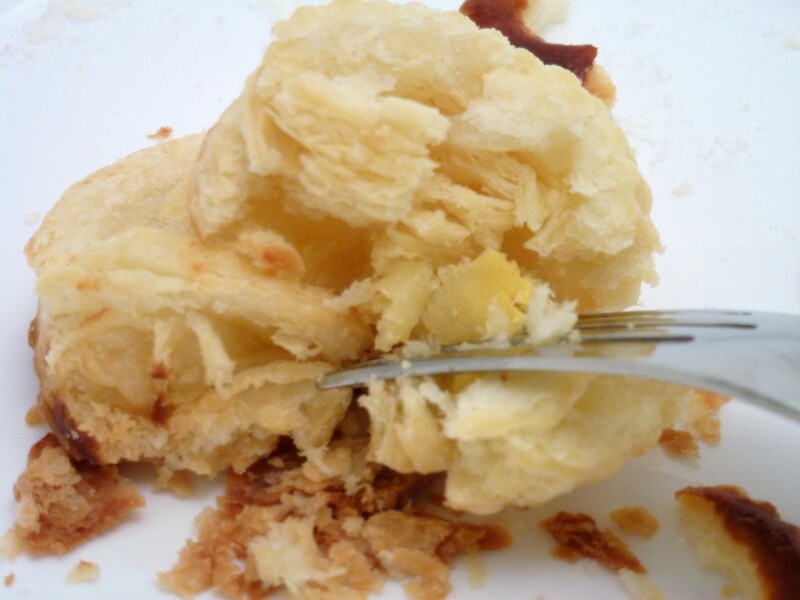 If the butter is too cold, it can break through the pastry layers. Butter leakage can be prevented by sticking to the resting/refrigeration steps and carefully handling the dough. Be sure to adequately flour your surface before rolling. If the dough sticks to any surface, the pastry can tear and expose the butter. Butter leakage can also be caused if the dough is too tough, so care should be taken to not over-mix it. Practice is the best way for you to get a feel for this dough. I made puff pastry at least five times with different recipes before I managed to succeed without butter leakage. Don’t be discouraged if you start seeing the butter emerge from between the layers. Just put the dough back in the fridge to ensure the butter is cold and cover the exposed butter with flour during rolling. Ok, I think that is enough talk about butter leakage. Let’s move on to the good stuff and how to actually make puff pastry. I have seen many different methods out there. Each pastry chef seems to have his/her own version. Surprisingly, many recipes out there are actually cheater versions, which incorporate the butter directly into the dough, instead of folding it inside the dough. This is actually called flaky pastry or rough puff pastry. While still delicious and puffy, and much easier than true puff pastry, it isn’t quite the same thing. Puffy pastry has two main stages in its fabrication: la détrempe, which is the doughy part and le tourage, which is the process of incorporating the butter layers into the dough. I’ve seen recipes incorporating butter into the détrempe as well the layers between the détrempe. I’ve tried a butter-free détrempe but find that incorporating some butter into the dough directly makes the process much easier. This is because butter hinders the formation of gluten, making the dough more pliable and easier to roll out. In a mixing bowl, stir together the flour and salt. Pour in the melted butter and stir with a fork to obtain a mealy texture. Make a well in the mixture and pour in the water. Stir with fork and then work the mixture together with your hands to form a ball. You may need to add more water to the mixture to incorporate all the flour. Be careful not to overwork the dough. Unwrap the dough and place it on a floured surface. Cut a “cross” in the top of the ball, as seen in the photo. 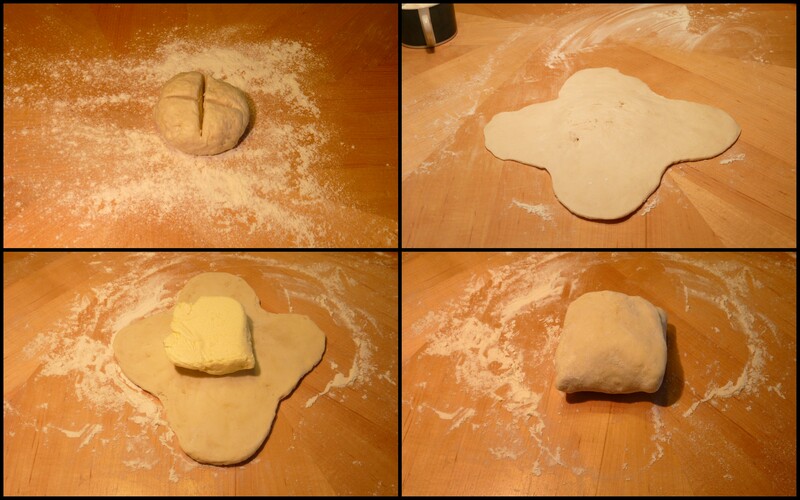 Roll out the four corners of the dough to form a flattened cross. Leave the small “dome” in the middle. Remove the butter from the fridge. Leaving it in it’s wrapper, or wrapping it with plastic wrap, work the butter with the palm of your hand or with a rolling pin. The goal here is to soften the butter slightly to the point where it is the same consistency of the dough. The butter should have a waxy consistency, not oily and overly soft. Roughly shape the butter into a square and place this in the middle of the dough. Fold over the “dough flaps” to seal in the butter. 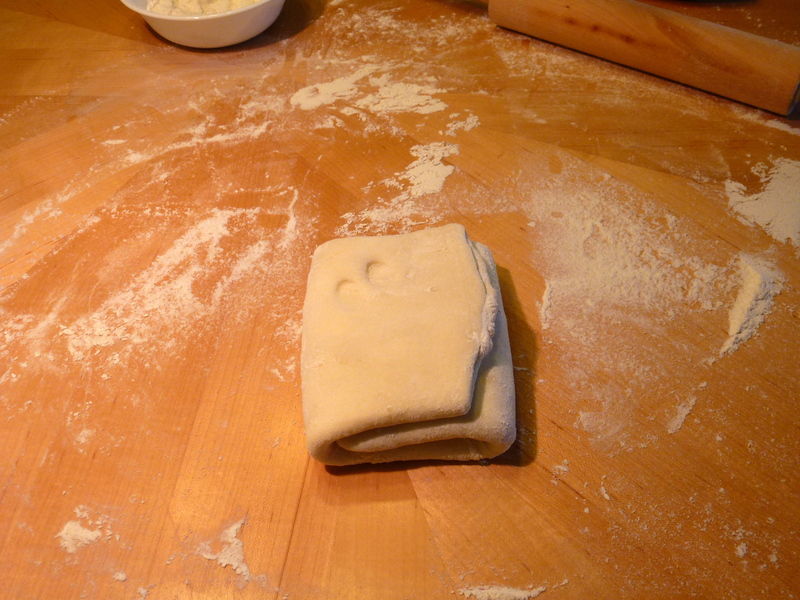 Before rolling, use a rolling pin to press down on the entire top surface of the dough. This will soften up the butter and prevent it from cracking. You want to maintain a smooth sheet of butter between the dough layers. 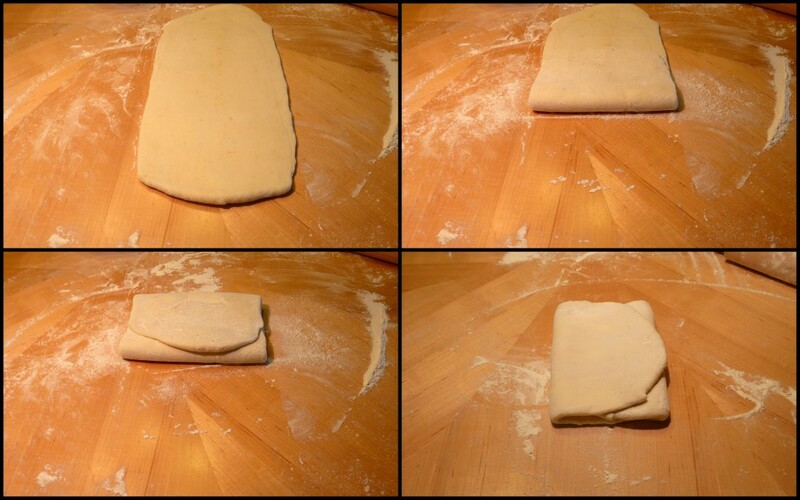 Roll the dough lenghthwise, to create a long rectangle. Be gentle if you don’t want butter leakage! Be sure to use enough flour so the dough doesn’t stick to the surface. Fold the dough into 3, like you would a letter. Brush off excess flour with a pastry brush (this is something I didn’t do enough.) Excess flour between the layers can burn, so try to avoid that. Rotate the dough so the “spine” of the fold is on the left. Repeat the rolling and folding. After completing the first two “turns” mark the dough with two fingers to remind yourself how many times the dough was folded/rolled. Wrap the dough in plastic and refrigerate for 30 min to an hour. Repeat this process over again, refrigerating the dough after you’ve completed two turns. 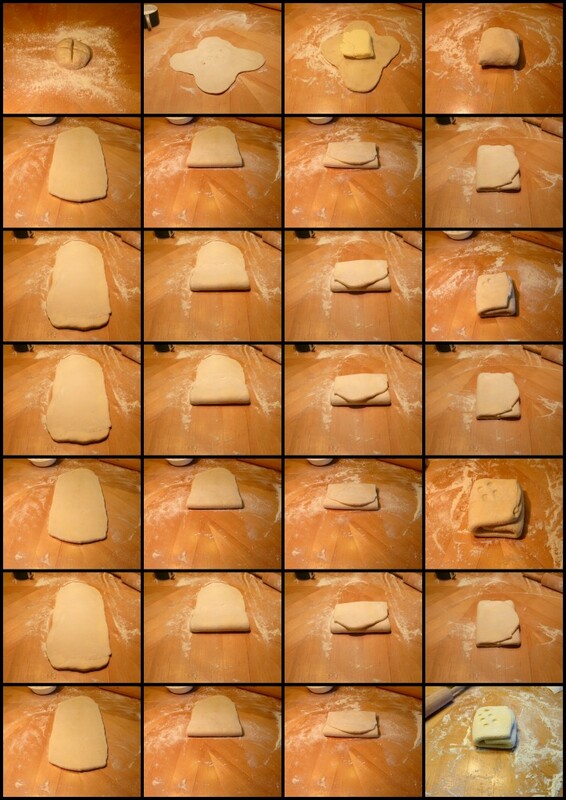 Mark the dough with your fingers each time you refrigerate it, to represent the number of turns completed. Once you’ve completed a total of 6 turns you are finished! Allow to dough to rest in the fridge for 1 hour before using it. If you find the butter is melting quickly, refrigerate after each turn, especially if you live in a warm climate. When not in use, refrigerate any extra dough so the butter doesn’t soften up too much. If you aren’t using all the dough, freeze the extra dough for a later use. Simply thaw in the fridge overnight when you want to use it. Holes in the dough will allow steam to escape and your pastry won’t puff up as nicely. Try to seal any holes by pinching the dough together. Flour between the layers can leave grey, burnt streaks in the pastry so brush off the flour as best you can. Use sharp edges to cut the dough. Dull cutters that drag through the dough will squish the layers together. We worked hard to create those layers, so don’t mess them up! Save your dough scraps! They won’t rise as nicely or look as pretty but they can be re-rolled to make things like cheese twists. Gather all the scraps and stack them on top of each other to roll out. Do not squish the pieces into a ball as you would lose a lot of the layers this way. I hope this hasn’t scared any of you into never making your own puff pastry. It really isn’t as much work as it may appear. Of course buying it frozen will always be much easier, but since when is the easier way the better one?